The author's point was that this is "chemical food" that possesses absolutely no nutritional value whatsoever, and how horrifying it is that this 12-year-old burger and bun looked exactly like one she just recently purchased. Do you believe that? I don't. But whether or not it is true, some Chowhounders were making comments like how it might be beneficial for us to eat McD burgers because 12 years from now we will look exactly like we do now. I think all these companies that spend millions on research and development for their anti-aging creams ought to just head on over to McD and check out what they're doing. Or, people can just bypass the middlemen and all those markups and head there themselves. When was the first time YOU ate at a McD? Do you remember? My first experience was at the one next to Revell Raceway on La Tijera in Inglewood. We would grab a snack there after a fun night of slot car racing. Back then the menu was pretty basic - burgers and fries. No Big Macs, Quarter Pounders, Filet O Fish, etc., just the burgers and fries. I thought the fries were fantastic - they were the best I'd ever had up to that time. Long, crisp and golden, if my memory serves me right they looked different then than now. The fries had little bubble marks on them from the frying. Maybe that's because they were fried in lard back then? That was the perfect evening for me back in my elementary and junior high days - slot car racing and McD afterwards. I must still have tons of preservatives in me. When McD opened on Crenshaw Boulevard I'd go there sometimes. Carol Kiyono worked there and one time she took my order, rang it up and handed me the bag. When I got home to eat it the bag was filled with a whole bunch of extra food. I had no idea she had done that and since I was by myself it ended up going to waste. McD isn't the kind of stuff you want to eat cold or even try to reheat. Had I known then what I know now thanks to that blog article, I could have just put it away in the closet somewhere and eaten it a few years later. Life was thrilling back then as more and more fast food alternatives popped up. Like Der Wienerschnitzel with their 18-cent chili dogs when they first started doing business on Crenshaw near 39th Street. Later on the price inched up to 21 cents. Once I accidentally gave the guy three pennies instead of two dimes and a penny for a chili dog. He gave me a puzzled look at first, and I gave him one back because I thought I had given him the exact change, then he shot me a huge grin. "All right!" he exclaimed and put the money in the register. A little bit later I discovered what I had done and to this day I still can't figure out that guy's reaction from my short-changing him. Jack in the Box was another favorite, with their 4 tacos for 99 cent specials. There's something strangely addicting about those tacos and their mystery meat, or should I say mystery fillings. And there's no other combination of textures like the shell and the insides anywhere else in foodland. On Friday nights my sister took art lessons at Hall's Bookstore on what was then Santa Barbara Blvd. (now Martin Luther King Jr. Blvd.). My biggest wish on those evenings was that she'd stop off at either Jack or Wienerschnitzel and bring some goodies home, which often she did. Mmm, so yummy! Those days were worth about 200 years of preservatives. By the way, do you remember a couple of other places located on that street? Like Donna Michelle's Boutique that smelled of incense, and was lit by lava lamps and blacklights? Further east closer to Audubon was Dr. Ishida's office, my doctor. Funny, so many of us JA's went to him and when we grew up we all said the same thing, he was a quack. Even my parents said he was a quack but we all went because he was the only Japanese doctor in the area. I can still visualize this nasty yellow liquid he gave me for a cold that made me feel worse than I did without it. Sometimes he'd give me a bottle of red liquid as well, with the same effect. From the immortal McD hamburger to Dr. Ishida.. how'd that happen? Getting back to food.. one last remembrance. Mr. Moto's was the first Hawaiian plate lunch place in the area as far as I know. It was run by a young husband and wife team and I'd frequently go there on weekends to pick up plates to bring home for my folks and me to have for dinner. The wife was really cute and outgoing. She'd chat with me while I waited for the order, and I would notice every single time I went there, her husband would be cooking in the kitchen area and giving me the nastiest scowls. And I do mean scowls.. come to think of it, I should have inspected the food before eating it! I always thought that was pretty funny. Unfortunately, they went out of business. 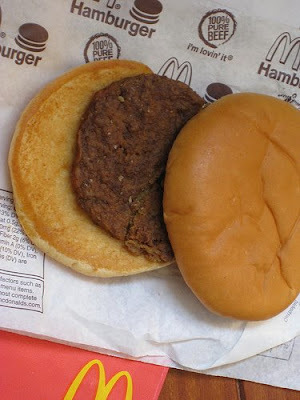 That's it for today, just a random recollection of food memories spawned by an indestructable McD hamburger.